The relationship between companion dogs and their humans can be a deep and mutually supportive one. Our dogs give us so much: joy with their company, laughter at their antics, comfort by their presence. Yet sometimes we do not have the specialized knowledge and skills to support their needs and challenges as they grow with us, particularly when they face or suffer from disabilities caused by accidents, infections, or aging. In this paper, the term “disabilities” refers to impairment of physical function such as sensory, mobility, neurologic, and cognitive abilities, and is a subset of “special needs,” which include a broader scope of challenges, such as reactivity, aggression, and anxiety. Veterinarians have weighed in to show how discoveries in medicine, behavior, nutrition, and exercise come together to create a lifestyle for our disabled companion dogs so that they may live the good life (Harris, 2015). Table 1 provides a quick summary. The interplay of medicine, environmental management, and behavior in treating dogs with disabilities. To date, some trainers have written or spoken about specific disabilities such as deafness (Hayward, 2015), seniority (Sdao & Stevens, 2014; Stevens, 2014), and canine cognitive dysfunction (Anderson 2016). We reached out to some of these authors, and they shared more of their personal experiences and insights with us. Terrie Hayward shared that the first challenge faced by guardians and trainers when they discover that their dog has a disability is often a psychological one. At the start, guardians may perceive an associated stigma about sharing their home with a disabled dog, which could evoke in them feelings of fear and anxiety. Speaking about deaf dogs, Hayward said it is important that guardians learn to reconcile themselves to the fact that their deaf dogs just cannot “hear” when they are not looking at a person. They are, however, able to do everything else that a hearing dog can. Lee Harris echoes the same sentiments when he noted to us that amputee dogs, contrary to expectations, often do not show impaired mobility. With my deaf dog, Blanca, I think the first time that she “got it” with the visual “clicker” was really impactful. It’s so amazing to see that communication link, and for me, for the first time with a deaf dog using a method besides a standard clicker or a verbal marker, just opened up an enormous set of opportunities for visual and tactile communications which I hadn’t really considered in the past. Our next dog will be deaf. From now on I would always look to adopt a deaf dog and choose to share my home and training journey with a deaf pup! Knowing this, the critical first steps a trainer must take would be to teach guardians that disabilities are not totally debilitating for their dogs. Trainers need to lead guardians to understand that they can certainly continue to build a bond and enjoy life with their disabled dog. This would be done by equipping guardians with an alternative toolkit of training skills for their dog. Eileen Anderson shared that another big challenge for a guardian and trainer would be to identify what the “new normal” for the disabled dog may be. On one hand, Lori Stevens says that it can be challenging knowing when a physically challenged dog might need more support in terms of health care and/or medication, as dogs are capable of pushing through pain even though they should not and it is not in their best interest. On the other hand, Eileen Anderson says, for dogs with progressive canine cognitive dysfunction, their dementia-related behaviors may appear miserable and pathetic, causing us to assume that they are in distress, even if they may not be. I used to take Cricket, my dog with dementia, on a walk every day. Before I had realized the scope of her dementia, our walks started to deteriorate. She continually pulled to the left. I thought she was wanting to explore my neighbors’ yard, but there’s only so far you can go into someone’s yard with your dog! I finally figured out, after observing her off leash, that she was trying to circle. She always circled counterclockwise. I realized that the leash pulling to the left was not volitional, that it had no intent to it. Because of that and some other behaviors, I realized the walks were not that enriching for her. Instead, I took her off leash and we would just hang out in my front or back yard several times a day, since she still enjoyed sniffing. Removing our assumptions about “normal” behavior for a dog with canine cognitive dysfunction helps caregivers better determine appropriate care for these dogs. As the disability progresses, one always has to determine if a dog is uncomfortable, anxious or in pain. As Stevens pointed out, it is thus our role as caregivers to be masters of observation in order to tell when something is not quite right. We hope that the ideas we present in our paper might enable more disabled companion dogs to be provided with a good quality of life—maintaining functional capabilities, enriching their mental state, and overcoming situations that trigger fear—so that the dog-human relationship will not be clouded and dimmed by the disability, but instead reveal a silver lining of renewed and deepened bonding between dog and human for having overcome the challenges together, through thick and thin. As they go through life, dogs will need different skills to live well in their world. The figure below is an overview of the various categories of learning and training needs, which we have named Cogs of Learning (COL), that a companion dog may go through as they grow from puppyhood into their senior years. We can think of one or more of these cogs being active at any point in the dog’s life, depending on the circumstances the dog is in. The COLs work in concert to provide a companion dog with the life and social skills they need to live their life to the fullest with us. For some dogs, the “Basic” COL may be the most important training focus and all that is required for a dog to be a treasured family member. For others, the “Basic” COL needs to work in tandem with “B-mod”—behavior modification—to enhance the foundational relationship between a dog and their human family. For dogs who have suffered health or physical issues that challenge their functional capability, the “Disability” COL is an additional way to maintain quality of life for these dogs. The “Plus” COL provides opportunities for specialized activities that build upon the other COLs. In the following case studies, we focus on dogs who are on the “Disability” COL and offer ideas that may help other dog guardians, trainers and care providers who are faced with similar challenges. As each dog and the behavior challenges they face are unique, any intervention approach must take into account that individual’s nature, preferences, abilities, and needs, and offer the learner as much choice and control as possible. Our training approach and philosophy in all of these cases embrace the principles of LIMA and fear-free cooperative care using positive reinforcement techniques. Kiyo is a 12-year-old, neutered male golden retriever, belonging to the first and second authors. This figure shows his Cogs of Learning journey from 2009 to the present day. Adopted from a shelter in 2008 at around 2 years of age, Kiyo was diagnosed with bilateral hereditary cataracts in 2009, which required surgery for the replacement of the lens in his right eye. At that time, Kiyo showed avoidance behaviors at having his eyes examined by the veterinarian, in particular, the application of eye drops. Kang & Lee (2013) described a behavior modification and cooperative care training program, dubbed “The Eye Game”, in which foundation cues like a chin rest and desensitization and counter-conditioning were successfully combined to build a positive conditioned emotional response (+CER) to the application of eye drops as part of Kiyo’s pre-operation preparation and post-operation care program. Kiyo lost his left eye in a second operation in 2012 but adapted well to his impaired eyesight. He continues to show a +CER to cooperative eye care and other areas of husbandry. As this video shows, Kiyo currently leads an active life. He participates as the neutral dog in dog-dog reactivity training classes, honing his life- and social skills, and learning new skills as part of a behavioral enrichment program that began from the day he was adopted. In 2016, we detected the onset of cloudiness in the artificial lens of Kiyo’s remaining right eye, and lipid crystallization on his cornea, which further impaired his vision and affected his behavior in familiar environments that had not posed a challenge before. Where he would have walked confidently across, he began to display signs of fear (backing away, crouching low, or freezing) when he encountered certain ground surfaces, e.g., dark, reflective or highly contrasting ones. Under certain lighting conditions, he may avoid going down staircases where all of the steps appear to merge into each other, or he would walk down very slowly in a crouched position, presenting with the signs of a fear of falling. He would also baulk at crossing from one area to another, where the boundary was a darker area, e.g., crossing between a concrete floor and a grass area, separated by a drain that was less than 12 inches in width. We can only surmise that the increased cloudiness in Kiyo’s eye interfered with his perception of depth in some way. In the above-mentioned situations, the “Disability” COL became incorporated into Kiyo’s training, together with the “B-mod” COL. We crafted a series of training games and management measures to address each environmental challenge as it occurred. These “Beat the Fear” training games used a combination of desensitization and counter-conditioning protocols and Behavior Adjustment Training (BAT) (Stewart, 2016). Desensitization and counter-conditioning helped create a +CER to each obstacle, while BAT allowed Kiyo to choose whether to approach or move away from an environmental challenge. As each new location would present a new challenge to Kiyo, these games are executed and adjusted at each location as needed. Management measures included laying down familiar non-slip and non-reflective mats to help him walk across a surface when we were not able to execute a training game at that time. We avoided environments that made Kiyo uncomfortable, and in client training classes, we chose venues that were familiar to Kiyo whenever he was present as the neutral dog. This video shows Kiyo in a “Beat the Fear” game of crossing a drain. Once a +CER has been established, Kiyo is able to cross the drain on cue. A fun element is incorporated by treating the game like an “agility weave” exercise. Here is another game involving going up and down a staircase. Between August and September 2016, Kiyo avoided climbing this same staircase. To date, if his eyesight does not deteriorate, Kiyo is able to walk or trot up and down the staircase without displaying fear. In 2017, our biggest challenge was to help 11-year-old Kiyo adapt to changes in preparation for his geriatric and/or emergency care. While Kiyo was still able to climb into our SUV to ride in the back seat, we wanted to prepare for scenarios where we may not be able to transport him easily in our SUV. We researched and decided to test if a commercial van with an open cargo space and low cargo floor height would provide a better fit for Kiyo’s needs. We chose the Nissan NV200 and we asked the car dealership if they would allow us to conduct some tests with Kiyo before we made a decision to purchase, which they did. In previous years, Kiyo had adapted easily without training when we changed vehicles and was calm and settled during rides. However, this particular change became a considerable challenge for him. This figure outlines “The Van Game” we created for Kiyo to help him adapt. “The Van Game” was conducted over three visits to the car dealership between May 9 and May 18, 2017, and thereafter, at different locations between May 26 and June 10, 2017, over daily short training sessions. We moved from one training level to another only when we had established a clear +CER in the preceding level. When first introduced to a test van at the car dealership showroom (Exercise A), Kiyo showed signs of fear at placing his paws on the dark mat flooring of the van and baulked at climbing in. We used platforms that Kiyo was familiar with to create steps leading into the van, and we covered the floor of the van with familiar non-slip mats (Exercise B). Again, by implementing a combination of desensitization and counter-conditioning protocols and BAT, we established a positive conditioned emotional response for Kiyo, and he was able to climb voluntarily into the van. During the test drive (Exercise D), Kiyo showed some signs of stress—he was unable to settle on the van cargo floor, and panted lightly. However, he responded to classical conditioning during the short drive, which indicated that he was not over threshold. We installed a low couch in the van to provide a more comfortable ride than the floor, and rigged up a safety harness and attachment system. While these helped, they did not completely mitigate Kiyo’s stress, which presented as increased displacement sniffing before entering the van, soft whining, and fidgeting to get off the couch during the ride. By having one of us sit in the van with him, we were able to implement classical conditioning during the ride. We made the challenge of night-time rides easier for Kiyo by installing temporary lights in the cargo area to remove the shadows, and again one of us rode with him. To date, Kiyo calmly rides in the van and is able to settle down and nap during longer rides, just as he was able to do in our previous vehicles. This video shows the initial and final levels in “The Van Game.” — exercises B and E6. Kiyo turns 12 in 2018 and the future challenges include the accompanying disability and health issues related to age. In relation to his eyesight, the gradual lipid crystallization observed in 2016 poses a risk of a corneal ulcer, which may lead to permanent blindness. In addition to providing support in ways suggested by Harris (Table 1) such as making the home navigation-friendly, we have started shaping “The Blindfold Game” for Kiyo. This video shows the initial stages of the game in which we provide a safe environment for Kiyo to begin navigating with senses other than sight. “The Blindfold Game” will progress to Kiyo navigating other areas of the home, before extending it to safe locations outside the home. While such pre-adaptation to blindness may not be seen as a necessary training tool, it nevertheless provides another opportunity for us to enhance Kiyo’s life skills, welfare, and quality of care. One Cog of Learning that has run through nearly a decade of Kiyo’s timeline is the “Plus” COL. While he does not participate in “Plus” activities like competitive obedience, agility, and other canine sports, we have been mindful of the need to keep him fit—through proper nutrition, exercise, maintaining a healthy body weight, and managing his hypothyroidism through medication. Our goal for Kiyo as he ages is to decrease muscle atrophy and maintain daily function. 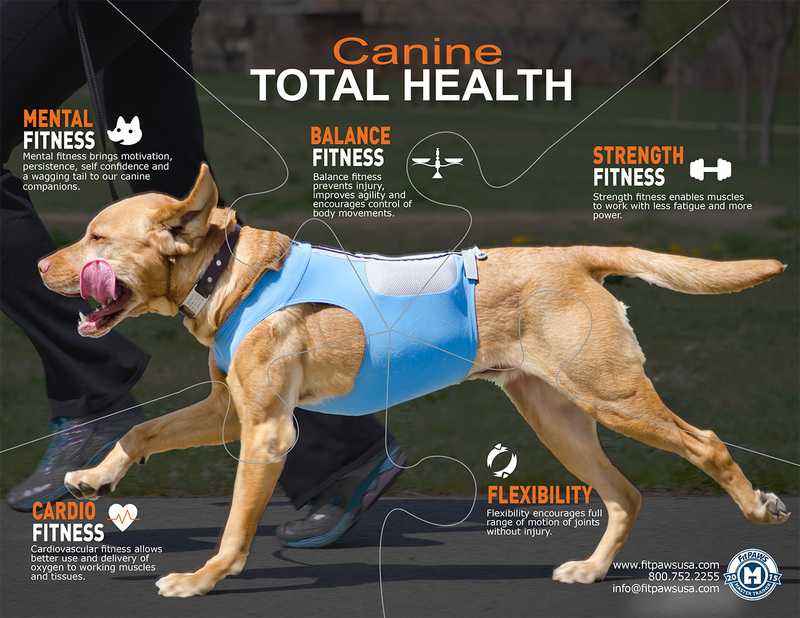 Thus, the first author, a certified canine fitness trainer, has established a low-intensity structured fitness and conditioning program in accordance with the principles of the Canine Total Health Puzzle, which targets five key areas of fitness training: balance, strength, flexibility, mental and cardiorespiratory fitness. Such a program provides Kiyo with additional physical and mental enrichment games that can help maintain his functional and mental capabilities as he ages. Here we can see Kiyo in an exercise designed to maintain proprioceptive awareness in his limbs as well as build core muscle strength and overall balance. Fitness games are not the only way that we continue to provide enrichment for Kiyo in his senior years—he continues to proof his life- and social skills, participates in the first author’s training classes, and engages in nosework games. On walks, Kiyo is allowed to choose his walking routes and engage in sniff walks interspersed with gentle trotting and loose-leash walking. Princess is a 6-year-old, spayed female rescue mongrel. She has had her right hind limb amputated and presents with mild luxating patella on her left hind limb, though the range of motion and mobility of that limb does not appear to be compromised. She exhibits separation-related anxiety for which she is undergoing a behavior modification program with the first author, a certified separation anxiety trainer, and is treated with fluoxetine, in consultation with her veterinarian. Princess is also reactive to dogs. While she is active and enjoys walks, stress precipitated through unforeseen dog encounters may impact her behavior modification plans for addressing reactivity and separation-related anxiety. In tandem with her “B-mod” COL, a structured exercise and fitness program was developed by the first author, a certified canine fitness trainer, to provide Princess with an alternative option to complement walks. It also helps to maintain her overall fitness to minimize the risk of physical injury—although it would not replace the need for consultation with a canine rehabilitation professional, should Princess require it. Thus for Princess, her COLs now include “B-mod” and “Plus” as part of her wellness care plan. Video 7 shows Princess’ guardian taking her through a hind limb strengthening exercise that may be easy for non-amputee dogs to execute but is difficult for a hind limb amputee. As she has no prior experience with a fitness program and equipment, her exercises were designed to be low impact, with a focus on achieving good form. By keeping the exercises short and fun, we were able to bring out the joy of learning something new in Princess, thus enhancing her relationship with her guardian. Goldie is now deceased after living for 14.5 years in the home of the third author. Goldie was about 6 months old, pregnant, and with a severe compound fracture of her right hind leg when she entered the San Diego County Shelter system. Her leg had to be amputated because of an infection resulting from the open wound and broken bones, and she was spayed at the same time. She would have been euthanized after the mandatory hold period had it not been for a rescue group that agreed to foster her in the third author’s home. It was decided that she fit well into the household, and so was adopted by the third author six months after surgeries. Goldie (right) was taught to sit, around other dogs to ensure that her tail wasn’t high and flagged. Goldie’s disability was not only physical, but emotional as well. In addition to the slow process of physical healing from two simultaneous major surgeries, she also had to blend in with two other dogs in her new home. Goldie adjusted gradually, with slow introductions and time making for a smooth transition. Behavior modification was used to help her relax and integrate with the other dogs. Basic training and classical conditioning occurred during mealtimes. Classical conditioning and barriers were also used to both ensure that all dogs were comfortable with one another, as well as allow Goldie to heal without face-to-face encounters with the other two dogs. This, together with a focus on management and safety when out in public, all helped Goldie adjust to her disability. During outings, it was noticed that Goldie seemed to elicit hard stares from other dogs at adoption events, even though she offered a lot of displacement and stress signals (ears back, ground-sniffing, avoidance of eye contact, lip-licking and more). After careful observation, it was noted that her tail position seemed to elicit the reactions from the dogs. Because she was missing her hind leg, she had adjusted her balance by holding her tail up high as she moved. This high, flagged tail was likely the signal to the other dogs that she was ready for intense dog communication, despite all the other calming signals she used in those situations. Attention and focus behaviors from the “Basic” COL were added to her away-from-home behaviors, which helped her to avoid staring at other dogs. She was also taught to lie down or sit in the presence of other dogs to avoid displaying her high-tail posture. In addition, Goldie was reinforced for spinning movement and stretching, encouraging her to maintain muscle strength in her rear end, shown in this video. As Goldie aged, a “Disability” COL focus was emphasized to teach her to be comfortable being lifted in people’s arms and/or with a towel to support her hind leg and back. A slow introduction of hands near her body, on her body, and finally slight lifts, which built to the actual lifting off the ground, provided Goldie with a sense of security and safety. This came in very handy when she suffered from vestibular disorder, which, aggravated by her missing leg, caused her to lose her balance. She needed the additional support and help to get around until she recovered. Gaia, a cane corso, now deceased, presented with many health issues, including Demadex mange, ear infections, eyelid protrusion (also known as “cherry eye”), and digestive disorders, that began around 3 to 4 months of age but seemed to intensify after her final round of vaccines at 6 months old. Due to her health issues, the success of early puppy socialization was affected, and Gaia developed a number of fears, including of other dogs, many vehicles, skateboards, baths, and a variety of people outside of the home. The third author developed a strong training program for the adoptive family using the “Basic” COL to build Gaia’s foundation skills during the first year of her life. Unfortunately, the need to repair the cherry eye and a concurring ear infection was the beginning of several setbacks in her training and created a need for behavior modification under the “B-mod” COL.
Gaia’s COL focus: Basic, B-mod, Disability, and PlusAfter her cherry eye repair surgery, where she was also spayed at 10 months of age, Gaia was released to her family, but began growling, biting, and mounting the husband and wife when they tried to administer eye and ear drops. As she weighed more than 120 pounds, Gaia’s behavior was not only dangerous, but also prevented the necessary medical treatment from being administered. A decision was made to house her at the veterinary hospital and allow staff to treat her, which included harsh restraint that triggered more fear and anxiety with regards to handling and husbandry needs, and it generalized to most parts of her body. To help with safety, Gaia was first acclimated to a muzzle. After desensitizing hands around her face first, using the protocol described in Arthur (2013), training made it possible for Gaia to love putting her face in the muzzle, as seen here. Again, working on the “B-mod” COL, Gaia was taught to understand the names of different parts of her body, such as her eyes, ears, head, etc., and allow husbandry treatments, both with and without a muzzle, depending on how invasive the treatment might be, as this video shows. At the age of 2 years, Gaia tore the first of two anterior cruciate ligaments (ACLs), requiring surgery to repair the damage and prompted the need to activate the “Disability” and “Plus” COLs. After each surgery, she needed rehabilitation to improve range of motion of the affected hind leg. During the first repair, she was taught how to move her back leg on a verbal cue. This facilitated her rehabilitation work, and later, when she began to age, helped to exercise her hind legs when the behavior was transferred by having her put her front paws on a platform and then move her hind legs from side to side using the same cue. This video shows part of this process. The end result of behavior modification was that Gaia could climb the stairs and be comfortable in the bath. Photo credit: Cindy Staszak. Resistance to baths became another focus for the “B-mod” COL. The emphasis was to work on helping Gaia climb a few stairs to not only help strengthen her hind legs, but to eventually to climb into a bath without force. This was a slow process, as Gaia tore her second ACL shortly after the first one was healed and needed another surgery to repair the tear before we could continue with the desensitization on the stairs and finally the bath. This process took about a year in total. The conclusion of the work achieved in the “B-mod,” “Disability,” and “Plus” COLs allowed Gaia to have regular baths, and to accept ongoing and necessary medical treatment and training, which she enjoyed as ongoing enrichment. These improvements continued until her death at nearly 9 years old. While a dog’s life appears to move along in a linear manner, their learning journey may not. Skills learnt early in life may be called upon to address challenges in later years, while learning new skills may become necessary as life circumstances change. We have termed this interplay of a dog’s learning processes through age and time “Cogs of Learning.” This phrase serves as a visual aid to explain how a dog’s behavior is not immutable, but can be adaptive to needs. Cogs of Learning interlock and combine their effect by integrating with one another. It is particularly important to have a strong “Basic” COL, which is the starting point for building the dog-human bond. Once the bond is established, it helps motivate the guardian to address other COLs, e.g., “B-mod” issues like fear and aggression in the case of Gaia. For Princess, her “Plus” COL of fitness exercises not only helps to address her disability, but also provides additional enrichment activities that enhance the dog-human bond. Sometimes one COL needs to be worked on before another can proceed, e.g., Goldie’s stares from other dogs because of how her tail carriage compensated for her disability required behavior modification before she could interact with the other dogs in the foster home for her “Basic” COL. The “Disability” COL is easier to implement if there is a robust foundation of the other COLs, e.g., Kiyo’s crossing drains was built upon the strong trust and an established history of using games in his “Basic” COL. Similarly, Gaia’s rehabilitation process for her disability was facilitated by a strong history of positive reinforcement for cooperative care and handling. It is every guardian’s hope that their companion dog will live out his days being healthy, comfortable, and safe. To do that, dog and guardian must embark together on a lifelong learning journey, which is fluid, and calls into play different Cogs of Learning that interlock, interact, and combine to create a strong foundation of skills to meet challenges that occur. Dogs with disabilities require special care from their guardians. Our article cannot encompass all circumstances and situations, and we recognize that not all disabilities can be addressed due to extenuating circumstances. But by capturing snapshots of the challenges that disabled companion dogs and their guardians have encountered in our case studies, we have tried to present ways in which we can help each dog face their own special challenges, and respond in their own unique ways. We have shown that with creativity, perseverance, and the application of force-free positive training, we can make our disabled companion dogs’ lives fear free, enriched, and fulfilling. We would like these case studies to trigger more ideas for canine enrichment, welfare, and training that deepen the dog-human bond, and help disabled dogs enjoy a good quality of life. After all, our dogs spend most, if not their whole lives with us; it is the least we can do to try and make that life as safe, enjoyable and enriched as it can be, for as much time as we have with them. We would like to thank Eileen Anderson, Dr. Lee Harris, Terrie Hayward, and Lori Stevens for their invaluable input. Much appreciation also goes to Yvonne Chia for her permission to recount Princess’ learning journey. Credit for Videos 1 to 6 belongs to the first and second authors. Video 7 credit belongs to Yvonne Chia. Photo and video credits for the images of Goldie and Gaia and Videos 8-11 belong to the third author, unless otherwise stated. Anderson, E. (2016). Remember Me? : Loving and Caring for a Dog with Canine Cognitive Dysfunction. Bright Friends Productions. Arthur, N. (2013). Muzzles—Not Just For Aggression Anymore! Harris, L.R. (2015). The Good Life For Dogs: health, lifestyle, happiness, meaning. Hayward, T. (2015). A Deaf Dog Joins the Family: Training, Education, and Communication for a Smooth Transition. CreateSpace Independent Publishing Platform. Kang, N. & Lee, J. (2013). Creating a Positive Conditioned Emotional Response – Putting the “Good” into Something “Bad”. The APDT Chronicle of the Dog. Summer Issue. Sdao, K. & Stevens, L. (2014). The Gift of a Gray Muzzle. Active Care for Senior Dogs. Tawzer Dog LLC (DVD format). Stevens, L. (2014). My Dog is Aging—Now What? More Training, Of Course! Stewart, G. (2016). Behavior Adjustment Training 2.0: New Practical Techniques for Fear, Frustration, and Aggression in Dogs. Direct Book Service. Nee Kang, Ph.D., CPDT-KA, CSAT, CCFT, is a scientist trained in the study of animal behavior, and a Fear Free Certified Professional. She founded cheerfuldogs.com, Singapore’s premium dog training and behavior consultation service. A strong advocate of a “Do No Harm” evidence-based approach to animal care, Nee uses humane, force-free training methods and games that are safe and effective for dogs and people. Her specialist areas of dog training include canine fitness coaching and separation anxiety training. Nee has conducted dog behavior workshops for dog guardians, and fear-free cooperative animal care training programs for staff and volunteers of shelters in Singapore. She founded the Dog Mentorship Project at the SPCA Singapore, whose goal is to provide shelter dogs with behavior enrichment during their stay in the shelter. She has published articles in the APDT Chronicle of the Dog and PPG’s Barks from the Guild, as well as articles on dog behavior and training in local magazines, newspapers, and shelter newsletters. “Cheerful Dogs, Happy People”, is what Nee wants to help all dogs and their guardians become. Jeffrey Lee, Ph.D., CDW, CPPS, is a biology-educator-turned-owner of dog walking and pet sitting company cheerfuldogswalking.com. Being a certified dog walker (trained by Nan), professional pet sitter, and member of Pet Sitters International, Jeff believes in bringing professionalism to the dog walking and pet sitting industry in Singapore. Jeff is passionate about applying evidence-based force-free approaches to his dog walking and pet sitting services, incorporating dog-centered enrichment activities to physically and mentally engage the animals in his care. He is a life member of SPCA Singapore, and helps Nee in dog behavior workshops for dog guardians conducted there, as well as in cheerfuldogs.com lessons that require a neutral dog. Jeff has co-authored with Nee articles published in the APDT Chronicle of the Dog. Nan Arthur, CDBC, CPDT-KSA, KPACTP. As the author of Chill Out Fido! How To Calm Your Dog and a Karen Pryor Academy faculty member, Nan Arthur brings 23 years of experience and works with dog professionals, shelter employees and volunteers, and pet dog guardians. Through her business, Beacon of Hope Dog Behavior and Training Services, Nan and her trainers provide dog training classes and private behavior consultations for both dogs and cats and their people. She also lectures and holds seminars that help the public and other trainers understand dog behavior. Nan has also developed volunteer training programs and lectures for many local shelters, ensuring that the dogs not only receive environmental enrichment, but positive training to help improve their adoptability.